Excellent for soldering fine chains and intricate jewelry items where precise application of solder is critical so there is no overflow to compromise the flexibility of the chain. 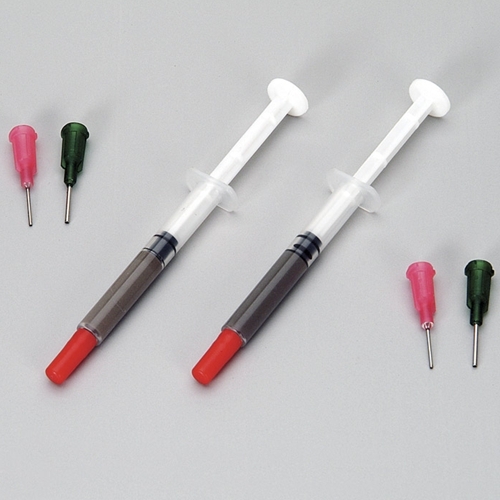 Alloy and flux are premixed in paste form and packaged in convenient dispensing syringes. Alloy will not settle to the bottom of the syringe tube. Syringes eliminate waste and improve the appearance of the joint area. Silver solders are cadmium-free. White Easy is a brazing alloy with excellent strength characteristics suitable for use on sterling and all non-precious applications. After brazing, it is white in color. Syringe contains 1/2 ounce of solder with silver content 0.336 TO. White Repair is a low temperature soft solder used primarily in costume jewelry, repairs, and applications where low temperature is very important. Syringe contains 1/2 ounce of solder and silver content is 0.0375 TO.